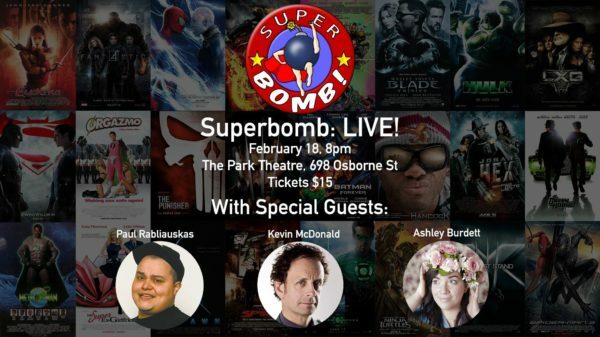 Home / Events / Comedy, Concerts, Upcoming Event / 8pm – Superbomb: LIVE! buy now A live recording of Superbomb!, the podcast about the most comically bad comic-book films ever made! Featuring special guests Paul Rabliauskas, Kevin McDonald, and Ashley Burdett, and we’ll be watching/discussing Fantastic Four: Rise of the Silver Surfer! For this live show, it is STRONGLY recommended that you watch the movie before attending the show so it’s easy to follow along with the show and to get all the jokes/references that may come up. Do your homework, it’ll be worth it for this one. There will also be games and prizes to be won! Hope to see you all at the show!